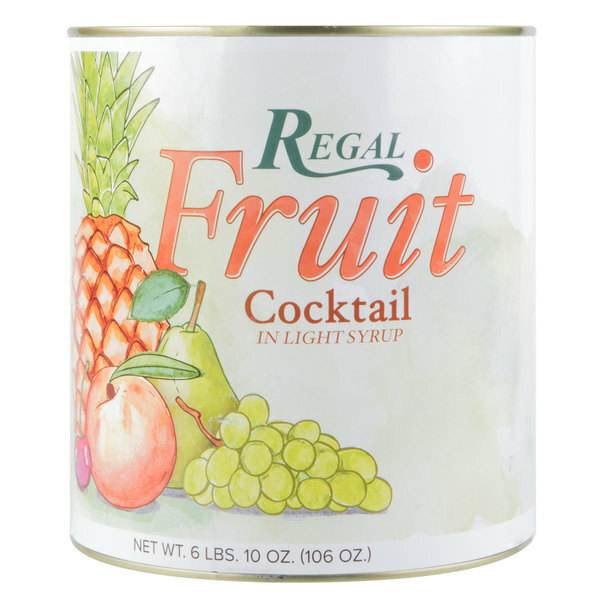 Add a pop of sweetness to your menu with this Regal Foods #10 can fruit cocktail in light syrup. Indulge your customers with this fruit cocktail's perfect assortment of sweet and subtly tart classic fruit flavors. This fruit cocktail combines a brightly colored mix of juicy peaches and pears with tropical pineapples, crisp seedless grapes, and sugary cherries in light syrup. This mix of smooth citrus flavors also makes for a sweet end to any meal. "This fresh, tasty fruit cocktail is an excellent value. 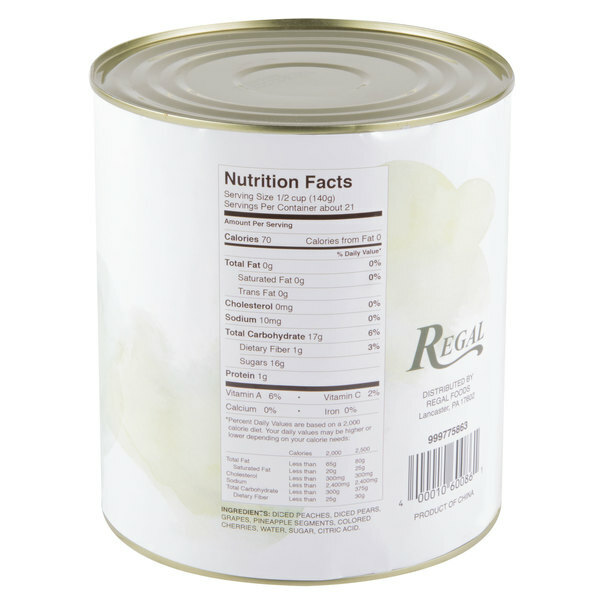 We bought one can to taste test and knew we would be buying by the case afterwards." High in Vitamin C, this consistent, high quality fruit is sure to provide a satisfying sweetness for your guests. Serve as part of a salad bar, with morning breakfasts at your diner or cafe, or as a side dish with hearty entrees anytime throughout the day. 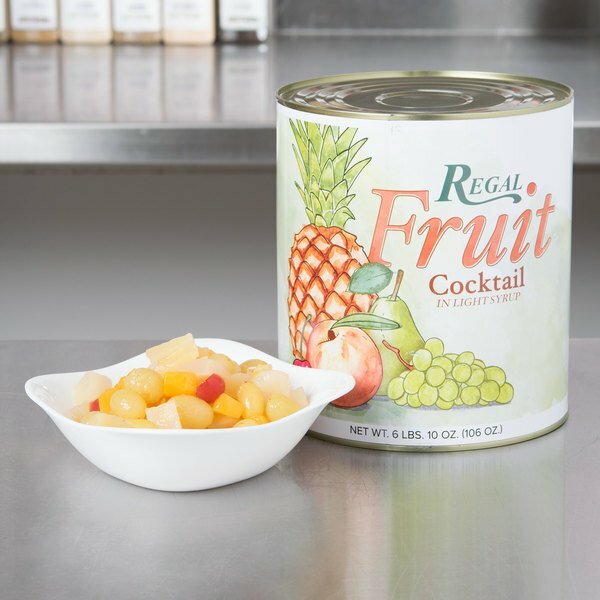 This fruit cocktail is packaged in a convenient, generously-sized #10 can and ready to serve for easy preparation and superior service. Perfect fruit combination for a great fruit salad without much effort. I have been eating this for a few months already, and I can say this is awesome for breakfast (or honestly at any time you want to have some fruit). The vitamin intake also makes me very happy about this product. The fruit cocktail is marvelous and is very tasty. The fruit variety is excellent and a nice sweet flavor. The cocktail makes a great fruit fluff salad. A quick and easy way to offer fruit cups with our breakfast bagels. The fruit cocktail is a great mixture of fruit and tastes swell. 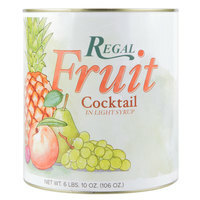 Love this fruit cocktail from regal foods. it is very fresh and full of great looking fruit pieces. A nice way to make a fruit salad. 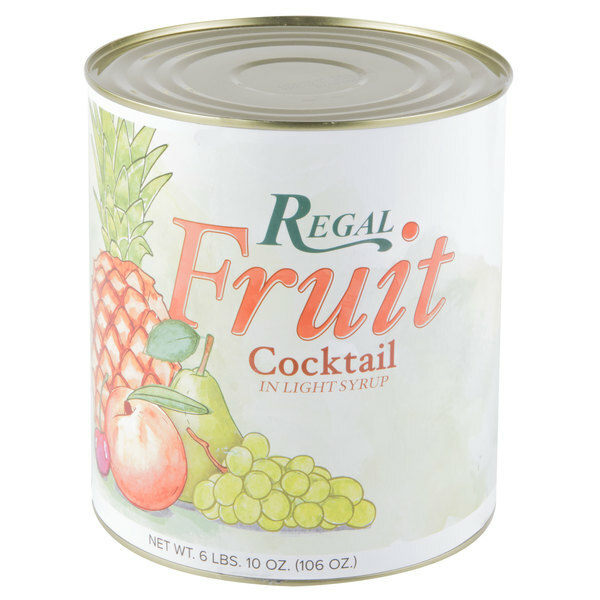 The Regal fruit cocktail is great and is bursting with fresh fruit flavor. The different fruits are perfect for making quick and easy fruit bowls that look and taste great. 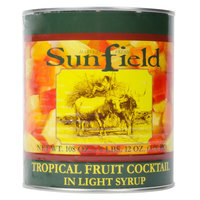 The fruit cocktail in light syrup is a nice and easy dessert for our cafeteria. The fruit taste great and the kids really love it. This is a great cost effective fruit cocktail for our salad bar. We also make a mean Ambrosia fruit salad by adding cool whip and coconut! Yummy fruit cocktail is great for making quick and easy desserts. We love mixing it with cool whip and jello for a light sweet dessert. nice Fruit Cocktail in Light Syrup, and at a very good price!!! this is a tasty fruit cocktail. i like to drain off a good part of the light syrup, strain it, then use the syrup to sweeten iced tea or fresh squeezed lemonade. A high quality fruit cocktail at a great price. The flavor is very good and the syrup pours right off. A great addition to our diner. This is tasty and convenient. It is a fruit salad already cut up and containing various fruits. The light syrup is indeed light, not too heavy but just right. First time ordering the Fruit Cocktail; but not the last. The taste is fresh not too sweet. We used the fruit for a large banquet and the guest enjoyed every bite. The fruit cocktail is used to include a variety of sweetness to drinks or other desserts. The pieces are bite size within a sweet simple sugar syrup. A few more cherries would not hurt this mixture. This is a nice fruit cocktail. The syrup is not too sweet but I dropped a star because it is very skimpy on the pineapple. We are going to reorder again but also want to try the tropical fruit cocktail. this is a nice addition to our canned goods section of the retail store, I haven't actually tried the product, but needed some to sell. the price was right and the quality looks good. This fruit cocktail is very light and full of flavor. We have 10 kids and need large quantities for lunch. This is perfect for us, and the quality is great. This fruit cocktail tastes amazing! I serve it to my guests after properly chilling it in the fridge and they absolutly love it, the price cant be beaten. This fresh, tasty fruit cocktail is an excellent value. We bought one can to taste test and knew we would be buying by the case afterwards. 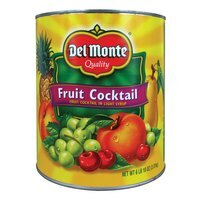 I particularly like this brand of fruit cocktail because, unlike dole or some other brands, this cocktail actually has distinctive tastes to each of the fruits and not just all the same with different textures. We buy this for the children, and they like as well as the other we were buying before. Very good buy and will order more. This is a great brand of fruit cocktail! Great healthy snack! 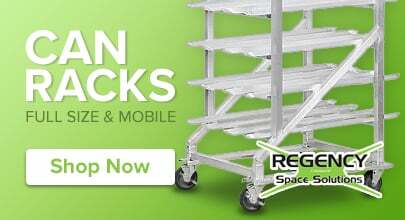 Good for cafeteria lunch buffets! I love baking this fruit cocktail into a cake! The fruit cocktail in Light Syrup is great. 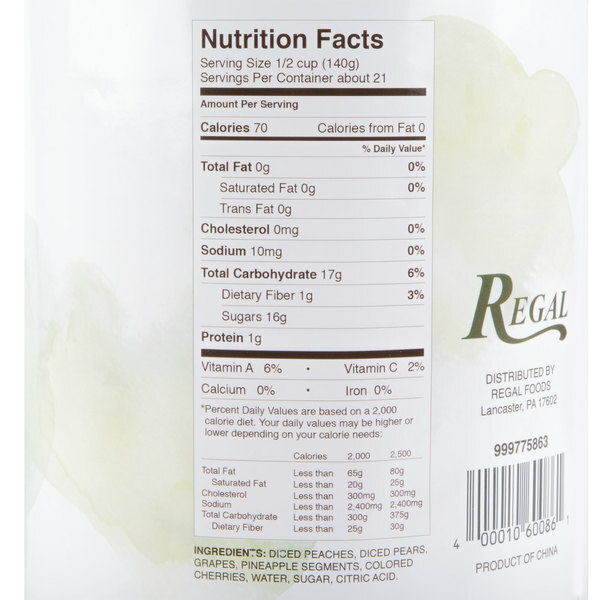 we love it .we add it to our salad bar .It combines peaches, pears, pinapples, seedless grapes, and cherries in light syrup.It also makes a great side dish. My customers at Spirit of Hope, Butterfly Cafe love the Celebrity brand of fruit coctail. I love it because of the cost. It's great fruit coctail without being expensive. This fruit cocktail tastes really yummy. Every time I serve it in a kids plate, I have to take some home to my kids as well.